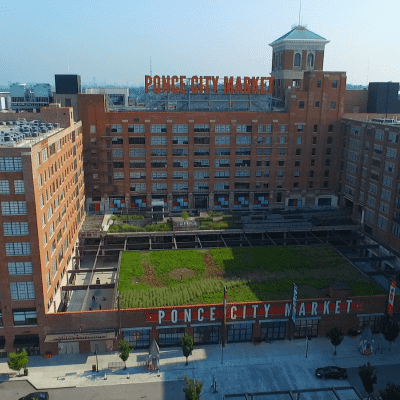 Ponce City Market (PCM) is located in one Atlanta’s trendiest and most historic neighborhoods, Old Fourth Ward (OFW). The 16-acre mixed-use development houses various national and local retail shops, restaurants, office spaces and residential units. Before it was PCM, it was Sears, Roebuck and Co. The building was later sold to the City of Atlanta and renamed “City Hall East.” In 2010, Jamestown L.P. purchased the building. PCM was opened in 2014 and listed on the National Register of Historic Places two years later. The surrounding OFW neighborhood is known for being the birthplace of civil rights leader, Dr. Martin Luther King, Jr. Tourists and residents alike can take in the history of this celebrated community with a visit to the Martin Luther King, Jr. National Historic Site, Historic Fourth Ward Park, Ebenezer Baptist Church or Sweet Auburn Historic District. The PCM Central Food Hall is quickly becoming the Southeast’s flagship food hall and market. From classic American and gourmet Italian to Korean street food and Latin tapas, there’s more than enough for every palette!